To ensure academic privacy, please use a cover page on your homework hard copies that does not contain any work. Turn in EITHER a hard copy or ecopy, not both. Vdd= 1.8 V, Vtp = - 0.4 V, Vtn = 0.4 V, Vtp,BE = - 0.5 V, and Vtn,BE = 0.5 V.
Tox = 41 angstroms for thinox, and 5000 angstroms for thick oxide. ε0 (epsilon) = 8.85 X 10 -14 F/cm and εoxide(epsilon) = 3.9. Cjbsn = 9.725 x 10-4 pF/ μm2 and Cjbswn = 2.27 x 10-4 pF/ μm (micrometer). Assume drain is the same. Cjbsp = 11.57 x 10-4 pF/ μm2 and Cjbswp = 1.8 x 10-4 pF/ μm (micrometer). Assume drain is the same. xj (diffusion depth) = 0.1 microns. 1. (10%) a) Describe how the input/output voltage characteristic transfer curve of the inverter appears when the PMOS and NMOS transistors are equal in size. b) If you could improve noise margin, what would be the best way to size the PMOS transistor, assuming the NMOS transistor is unit size? 2. (10%) Size a 3-input NOR gate for equal rise/fall times in the worst case. 3. (10%) What is the ratio between the RC time constant of the rise to fall time in the worst case if you build a 5-input NAND with only unit size transistors? Note: all transistors are unit size, including PMOS transistors. Note: Lecture 15, to be presented 3/6/14, will cover techniques needed to solve problems 4-8, below. 4. (15%) Use the compound gate shown below. Label all drains and sources. 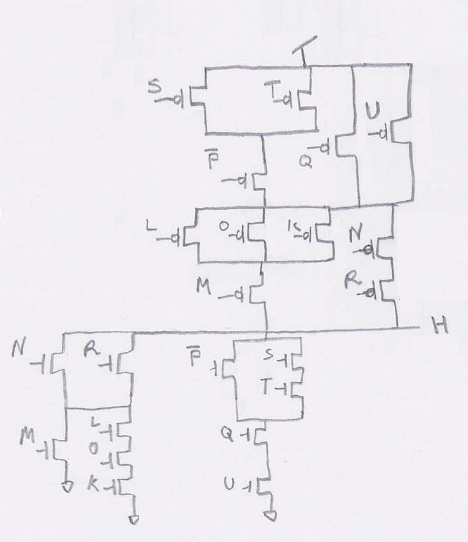 Show an identical Euler path for both NMOS and PMOS transistors by listing transistor inputs on both paths. If you cannot find a complete Euler path, you might need to add an extra transistor or two. Do not rearrange the transistors. 5. (20%) Give a stick diagram for the compound gate in Problem 1 above, using the Euler path you found. 6. (10%) Size the devices in the longest paths in the compound gate to give equal rise and fall times in the worst case. Note: in case you added extra transistors, then you need to size the compound gate with the extra transistors. 7. (10%) How many diffusion capacitances get charged/discharged in the worst case that affects the output node, assuming no diffusion regions are shared? 8. (15%) A design has a number of common inputs/outputs that need to be connected. Use the left edge algorithm to connect common inputs using as few tracks as possible. The starting and ending positions of each common input are given below. You can assume the inputs come from either the top or the bottom of the channel to make the problem easier. If two wires start or end at the same point that does NOT mean they are or should be connected.